Explaining extant patterns of host plant associations in insect herbivores is a primary goal of insect ecologists. Both plant nutritional quality and the susceptibility of the herbivore to enemies while on the plant can influence host plant suitability. However, the relative importance of these factors, as well as the temporal stability of their interaction, is poorly understood. 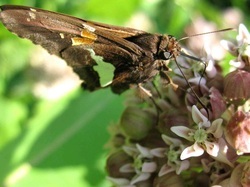 My colleagues John Lill (George Washington University), Eric Lind (University of Minnesota) and I are examining the ecological factors underlying the recent host expansion of a widespread butterfly, the silver-spotted skipper (Epargyreus clarus), to include several novel non-native plant species. Our grant proposal was recently funded by NSF (yay! 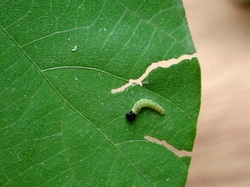 ); our investigation, which involves multi-year experimental field manipulations of caterpillars and predators, surveys of plant nutritional quality and predator abundances, and modeling of the parameterized results, will be the first comprehensive investigation of temporal variation in both plant-based (bottom-up) and enemy-based (top-down) measures of fitness for a non-specialist herbivore. My interest in defecation behaviors of animals (and insects in particular) grew out of my studies of frass-flinging by skipper caterpillars. Whereas foraging has been a major focus of ecological and entomological research, its obligate partner, defecation, has been comparatively neglected. Insects exhibit a range of intriguing behavioral and morphological adaptations related to waste disposal in a range of contexts, including predator-prey interactions, hygiene, habitat location, reproduction, feeding, and shelter construction. Some insects, for example, make use of their own excrement as a physical or chemical defense against natural enemies, while others actively distance themselves from their waste material. Internally feeding insects, fluid-feeders, and social insects face particular challenges because their feeding behavior and/or site fidelity makes them especially vulnerable to problems associated with waste accumulation. As is true for foraging, ecological interactions involving defecation may have far-reaching evolutionary consequences and merit further study. Though most research on insect learning has focused on bees, we have established that Lepidoptera are also very capable learners, both as larvae and adults. Indeed, a capacity for rapid and flexible associative learning allows butterflies to adjust their foraging efforts in response to variable floral resources and to locate appropriate host plants for oviposition. We use both field observations and controlled experiments to address questions concerning innate and learned color, shape and pattern preferences, duration of memory, and reversibility of learned cures. We have also determined that caterpillars can learn to associate tastes and smells with aversive or appetitive stimuli, and that in some contexts, memories formed in the larvae can survive metamorphosis and subsequently affect adult behavior. Divya Uma (PhD 2010) introduced our lab to the study of mud-dauber wasps, with a particular focus on the sensory ecology of interactions between the wasps and their spider prey. Most recently, our investigations of jumping spiders that mimic ants morphologically and behaviorally (including an 'antennal illusion,' in which the spiders hold their first pair of legs above their heads like antennae!) has revealed that the mimics are protected not only from visually-oriented spider predators, but also from chemically-oriented sphecid wasps, as well as their own model ants. To our knowledge, such 'double deception,' in which a single organism sends misleading visual signals to one set of predators while chemically misleading another set, has not been reported. Jean Tsai (PhD 2014) introduced our lab to the study of sexual selection in Nasonia vitripennis (Chalcidoidea: Pteromalidae), a tiny wasp that parasitizes the pupae of flies found in bird nests and carrion. Generally, adult males emerge from hosts before females and fight for access to puparia from which females will eventually emerge. When adult females emerge, they often mate before dispersing from their natal host patch and finding new hosts in which to oviposit. Our research focuses on male-male agonistic interactions and male-female interactions. Specifically, we examined factors influencing male-male contests, the dynamics of these contests, and the role of these contests in determining male mating success.